The dedication of the Volunteers of Ballincollig Tidy Towns is evident in how well the town looks throughout the year. 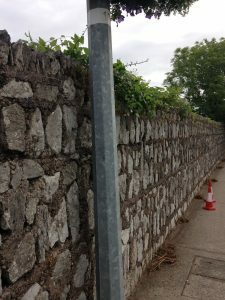 Some Volunteers are so committed to their cause that they often go beyond what is ‘expected’ so that Ballincollig can be improved upon even further. Ger is one such Volunteer. 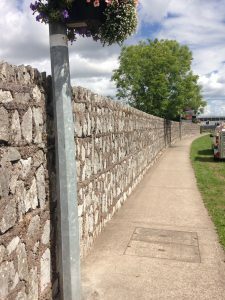 He attended a training course on the Maintenance of Natural Stone Walls and how to deal with ivy and other plants that can ‘inhabit’ them. Murphy Barracks was purchased by the O’Flynn Group for development. Part of the Barracks wall runs from The Oriel House Hotel to the Muskerry Estate Junction. This impressive wall makes quite a statement in the heart of Ballincollig. In the past week, Ger spent three days on a mobile scaffold painstakingly removing ivy, bindweed and other plants from the top of the wall. The result is fantastic and makes this piece of Ballincollig’s heritage stand out all the more.